Centrally located in the beautiful secluded gated community of Bonita Bay. The condo is equipped more like a daily live-in home, rather than a vacation rental. In 2019, a new king size mattress and bedframe with four built-in drawers, end tables, and lamps were purchased for the master bedroom as well as new tile flooring in both bedrooms. There is a 42" flatscreen TV with built-in DVD player and Apple TV in the living room, 42" 4K flatscreen TV with Amazon Firestick in the master bedroom, and a 32" flatscreen TV in the guest bedroom. All three TV's have cable. Wireless (Wi-Fi) high speed internet access throughout the condo. 18/10 stainless cookware, beach towels, coolers, beach bags, tennis racquets, wine aerator, coffee grinder, and a DVD collection of 50 titles are some of the typical extras that we provide as normal condo contents. The condo has never has been smoked in and is being listed as a Non-Smoking unit! No pets. - Twelve miles of walking and biking paths. - Three parks that include basketball/tennis courts, exercise stations, picnic areas, and playgrounds. - Boardwalks and fishing pier into Estero Bay and the Imperial River. On-site canoes can be utilized free of charge through Bonita Bay's main gate. - Free boat docking space at guest marina that connects to the Gulf of Mexico. - Fishing, sunset cruises, and wildlife viewing cruises can be arranged at the Bonita Bay Marina. - Free shuttle service from Thanksgiving through April to Bonita Bay's owned property (Bonita Bay Beach - Little Hickory Island) on the Gulf of Mexico. Guests can also drive their own vehicles off season to Bonita Bay's private beach property. Guests are provided with chaise lounge chairs as well as umbrellas (at no cost) year round. The private beach front property comes equipped with gas grills, covered eating areas, and private restrooms and showers solely for Bonita Bay guests and owners. Catered food service on-site is available seven days a week beginning in January and ending in April. Food prices are very reasonable. Within the condominium complex of Wild Pines, there is a pool and spa with its own screened-in pool house. The pool house is equipped with a refrigerator, microwave, and tables for eating and/or socializing. Restrooms are conveniently located within the pool house. Private tennis courts are just steps away from the pool and the adjacent gas grills for cooking. The Wild Pines pond is a stones throw away from the back door of the condo for fishing. A swinging bench rests on its bank for relaxation and wildlife viewing as well. Located outside Bonita Bay's gates is an abundance of restaurants and shopping to the North and South of the community along the U.S. 41 highway corridor. Within walking distance is 'Promenade at Bonita Bay', which is a newly developed array of restaurants and retail shops that are located directly in front of Bonita Bay. The Promenade restaurants and retail shops were built for the residents of Bonita Bay as an additional convenience and amenity. Additionally, directly across the street from Bonita Bay is a Publix grocery store as well as a Fresh Market grocery store, Amoco gas station, Outback Steakhouse, Carrabbas, and Dairy Queen. My wife and I were both born and raised in Illinois and we currently live in the inner city of Chicago. She is a Neonatal Intensive Care Unit Nurse and I manage golf courses for the Chicago Park District. We have a toddler and a Vizsla dog that is more or less our second child. We love our summers and fall here, but there is nothing like wearing flip flops in the middle of winter in Florida! 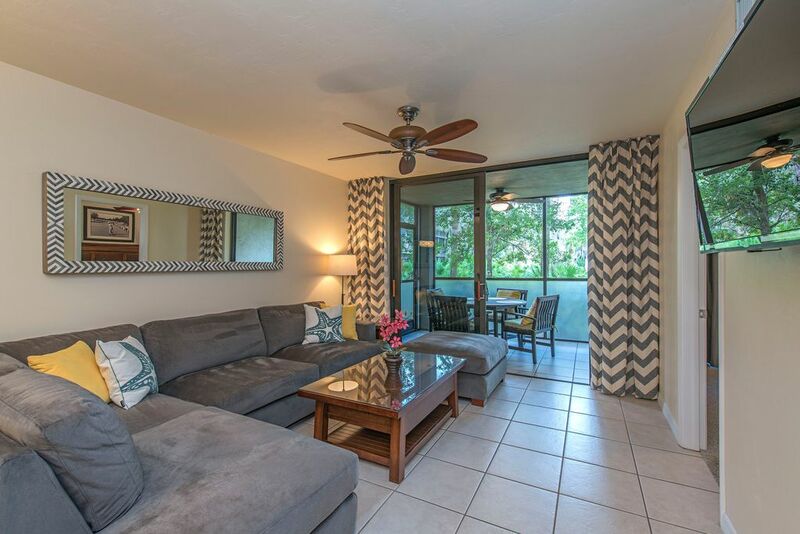 We have furnished and equipped the condo like it's our second home, so the experience is like being in your own home for all the couples and families that have the ability to enjoy it! Dedicated WiFi internet inside the condo. Additionally, a wired and wireless printer is available for use. However, ink and paper is not provided. Three flatscreeen televisions. Living room television is equipped with Apple TV. Bedroom televisions are equipped with Amazon Fire Stick's. All three Televisions have built in DVD players. Dozens of DVD's provided inside the condo as well as a Redbox (DVD rentals) located directly across the street from the community of Bonita Bay. Canoes are available for use at the parks -free of charge- through the front guard gate. Three tennis racquets (two adult and one child) and tennis balls are provided. A pool pavilion is located adjacent to the pool and spa, which has additional covered seating, restrooms, and a refrigerator/freezer. There is a 'LA Fitness' workout facility located a few miles down the street in Bonita Springs. Weekly and monthly passes are available for a nominal fee. Also, bicycles can be rented for the day or week through a company called 'Bonita Bike and Baby'. Their mobile service will drop off and pick up bikes from the condo. Brett was very quick at responding to any questions and provided detail information in regards to our stay. Two things: Very noisy terrass door, when they opened and closed the door in the apt upstairs it sounded like thunder. There are no reading lights in the bedroom. Brett was easily reached and very quick to respond to any questions. The condo was great for the two of us! We didn’t spend a great deal of time here because we were always on the go! Love that it is close to everything! It was wonderful to come back in the evening and relax in such a serene environment! Loved the landscaping! It felt like we were in our own little forest away from the hustle and bustle! really great value condo in secure high quality gated community.Has everything you could wish for on holiday including ( wait for this any uk readers ! ) an electric kettle !!! ( the first usa owned condo in 30 years that we have rented to have one !! )...i know its sad but you can believe what this means to us brits!. Good pool area and own beach which is a bonus.Also for any anglers out there a really good fishpond (lake ) outside the frontdoor..worms over corn for the serious fisherman. This is a great rental. Terrific amenities, clean, close to everything. Private beach was amazing! Everything as seen in pics and written totally accurate and beautiful. Thank you! Had an amazing four nights in this wonderful condo. Loved the decor and super clean. Truly loved the condo and the area. Quiet area, great amenities, private beach, nice outdoor pool area with beautiful landscaped grounds. Brett, the owner, responded promptly and was very helpful and friendly. Will definitely be back and tell others about this wonderful place! Wouldn't change anything only increase time to be there!